This Excel Utility will calculate and generate Account Slip of Provident Fund. Please fill in the data carefully. You may change the rate and amount of subscription at any time. Select the appropriate case type. There are 3 types, Normal Case, Retirement Case and Death Case. Rate of interest from the financial year 1996-97 to 2018-19 is auto filled. You don’t need to find the interest rates here and there. This utility will be updated regularly as and when new rate will be published. You can also manually update the chart of rate of interest as and when required. This utility calculates the final balance in the provident fund account automatically based on the prevailing interest rates for the tenure. 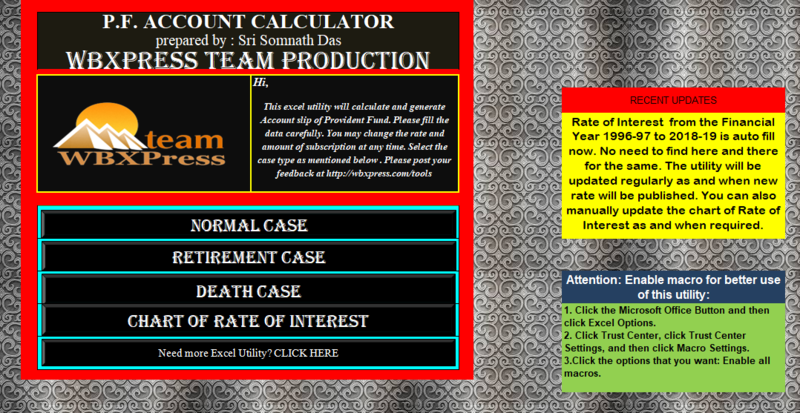 The Interest Rate Chart is also provided in this utility which you can further update yourself if necessary. The utility will still be functional correctly. This utility is prepared by Sri Somnath Das, Judicial Department, Katwa, Burdwan. GPF calculator is password protected. So cannot open. Though the sheets of the calculator are password protected, it can be opened in any computer having Windows Office 2007 or higher version.